Please check our Coverage page to see what deserves an article and what doesn't. Be sure to join the discussions going on our board. From NintendoWiki, your source on Nintendo information. By fans, for fans. Cubivore: Survival of the Fittest is an adventure game developed by Saru Brunei and Intelligent Systems for the Nintendo GameCube. The game was released by Nintendo in Japan in February 2002, and would later be released in North America by Atlus in November 2002. Eat or be eaten! Assume the role of an animal in its early stages of evolutionary development. As your animal instincts take over, you will boldly travel hostile environments and savagely stalk your prey to assert your place in the animal chain of power. Will you have what it takes to become the new king of the beasts? Abstract cubic style comes to life, as a huge array of surreal creatures interact with their natural environments! Dolby Surround Sound immerses you in a world of wild grunts, menacing growls, and terrifying screeches! Ferociously addictive gameplay! Only a combination of strategy, instinct, and luck can keep your beast alive! Cultivate your beast's strengths by carefully selecting both your prey and mates to evolve in the most effective way! Once, the colored beasts freely roamed the land, which was filled with Wilderness. However, the colorless beasts soon arrived and began to devour all of the Wilderness. The beasts kept the Wilderness for themselves until it formed Raw-Meat. The most powerful, with six pieces of Raw-Meat, dubbed itself the Killer Cubivore, becoming the ruler of the world. Starting as a small beast, the player's beast sets off on a quest to grow until they can become the King of all Cubivores. Cubivore revolves around the player, starting as a small animal, attacking and defeating other animals to gain mutations and increase their strength. Pressing L will target an enemy, and then pressing A will attack them. Animals come in one of five different colors, which each have different abilities. The player can swap between any mutations that they have acquired at any time using the EZ Mutate catalogue. Throughout the game, the player will be given the opportunity to mate, which will produce new Cubivores with different mutations and one extra limb; the number of mates the player can attract will increase as they gain more mutations. 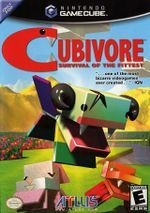 Cubivore was originally in development as a title for the Nintendo 64DD; the game would later be converted to a standard Nintendo 64 Game Pak, slated for release in January 2001. However, the game would be converted again for release on the Nintendo GameCube. In total, the game took around four-and-one-half years to develop. According to Saru Brunei founder Gento Matsumoto, the game was developed for Nintendo hardware as he disliked the longer loading times of the PlayStation hardware. When asked whether or not the game would see a release in North America, Shigeru Miyamoto would state that it and Doshin the Giant were being reviewed by Nintendo to see if they would be suitable for an international release. Atlus would later announce in August 2002 that they would be publishing the game in North America. Cubivore received mixed reception upon its release. While most critics appreciated the game's more unique gameplay and mechanics, it was primarily criticized for a lack of depth, the game's camera controls, and its short length. In its first week of sales in Japan, Cubivore was the second best-selling game, with around 48,694 sold. ↑ Doubutsu Banchou. IGN (January 9, 2001). Retrieved March 10, 2019. ↑ Gone to GameCube. IGN (February 11, 2002). Retrieved March 10, 2019. ↑ 3.0 3.1 Describing the Shibuya Event Round #2. Nintendo World Report (February 19, 2002). Retrieved March 10, 2019. ↑ Nintendo Roundtable. IGN (February 28, 2002). Retrieved March 10, 2019. ↑ Dobutsu Bancho Coming to USA. IGN (August 5, 2002). Retrieved March 10, 2019. ↑ Famitsu Scores Doubutsu Banchou. Nintendo World Report (February 19, 2002). Retrieved March 11, 2019. ↑ The Famitsu Top 30! Nintendo World Report (March 8, 2002). Retrieved March 11, 2019. This page was last edited on 12 March 2019, at 03:23.